Mt. 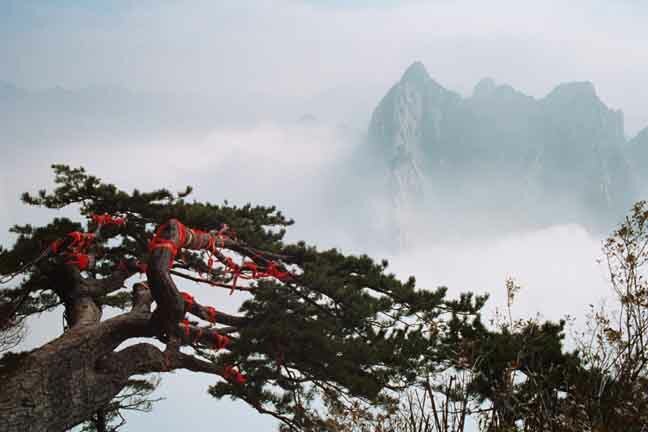 Huashan is known as 'The Number One Precipitous Mountain under Heaven'. It is one of the five sacred mountains in China. From a distance the five peaks seem to form the shape of a 'flower' (hua in Chinese), hence the name 'Huashan'. It is famous for its natural vistas of steep and narrow paths, precipitous crags, and a high mountain range. It is home to several influential Taoist temples where emperors of past dynasties made pilgrimages, making Mt. Huashan the holy land of Taoism. An ancient Pine tree with red "wishing for good fortune" ribbons. Hua Shan view of a Mountain Gate. Hua Shan view of a scenic mountain trail. Hua Shan view of Daoist temples on a neighboring peak. View of West Peak, an excellent location to view spectacular sun sets. View of "Lucky Locks" along a scenic path. A mountain path made of hand carved stone steps leads to a spectacular view at the top.